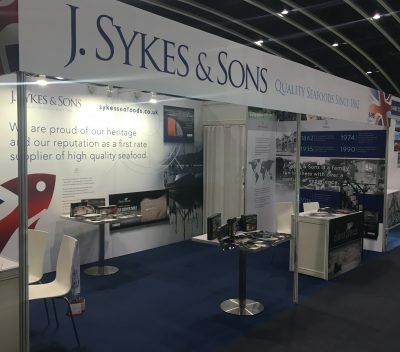 Sykes are extremely proud to have exhibited at the Seafood Expo Asia 2016, in Hong Kong. Seafood Expo Asia is a meeting point for Fish and Seafood professionals from a range of countries across the globe with the aim to expand business into the Asian Markets. The show had over 250 exhibitors, showcasing an array of products from Fresh fish to frozen, from packaged to processed and everything in-between. The attendance reached a new high of 8,700 seafood professionals from 62 countries. Sykes’ 18sqm stand was positioned strongly at the entrance of the exhibition hall (stand 5-901), and was successfully visited by a range of contacts throughout the week. The stand proudly boasted new artwork and branding across Sykes’ two main brands – Arctic Royal and Clear Seas, both of which have had a strong introduction to the Asian market. Sykes is also exhibiting at Seafex in November which is based in Dubai and targets the Middle East markets. Sykes are proud to fly the flag for British exports.